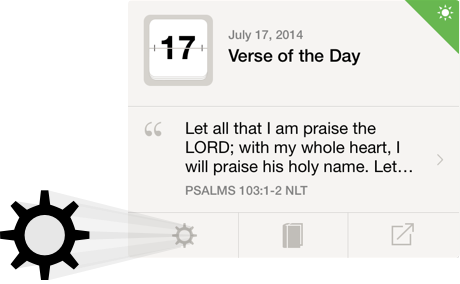 People ask us all the time if the Bible App can send them the Verse of the Day, so they’ll never miss one. And now it can! If you’re new to the Bible App, the Verse of the Day is a select daily passage intended to encourage you, refresh your perspective, and help you focus your thoughts on God. Of course, you’ll want to read more of the Bible than just one verse a day, but the Verse of the Day is a quick, easy way you can remind yourself what’s important. Available now on iOS (newest 5.1.1 release), this handy feature is also coming soon to the Bible App for Android and to bible.com. Maybe you like thinking about the Bible first thing when you wake up. Or meditating on it as a midday reminder. Or perhaps at bedtime, so you can think about it as you’re drifting to sleep. Whatever your preference, just tell the Bible App when and how you want your Verse of the Day delivered…and we’ll do the rest!